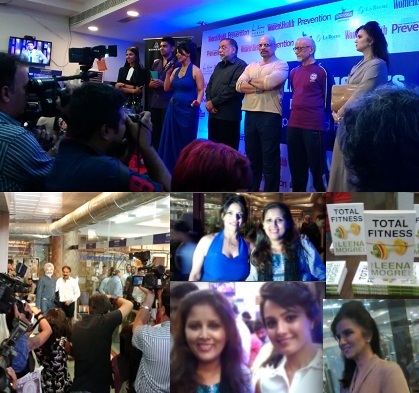 On 30th April, LM Fitness Centre, Bandra ( a gymnasium ) was bustling with people and activity for the launch of the debut book 'Total Fitness' of Leena Mogre, a fitness expert, by the celebrated Bollywood actress Madhuri Dixit. The book is published by Random House India & Penguin India. Leena Mogre is one of the pioneers in the health and fitness industry, and the first to introduce the idea of celebrity fitness in India. She is an institution in herself. On the occasion of the launch of her book, she regaled the guests and media present with incredible anecdotes of success stories and said, "This book brings you comprehensive and distinctive insider secrets - everything from the myth of size zero to assessing your actual strength and fitness before starting out; and finding your comfort zone and pushing beyond it gradually to achieve complete fitness. 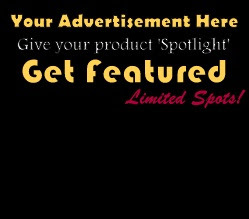 It is the perfect guide for anyone looking to get fit the right way." I had received a media invite to cover the event. The thought of seeing the Dhak-Dhak girl 'live' for the very first time in my life had me ordering my auto-wala to drive faster, as I didn't want to be late. Though I reached on time, the whole gym was waiting eagerly for the Diva to show up. Guests poured in, some notable celebrities too ( Nita Lulla, Bharat Dhabolkar, Candice Pinto & fiance, Anita Hassanandani & hubby, Vithal Kamat, Timmy Narang etc ), and yes, some of them spoke on stage too about their long association with Leena Mogre. Some guests had traveled all the way from places like Nasik, Pune, Kalyan etc to show their support. So, by the time the Diva reached the stage, my hands stopped shaking and clicked these, somewhat more stable pictures. She waved at the crowd gathered, how sweet. Though, she is almost 50 now, Madhuri can easily pass off for a twenty-five year old. Thus proving, that a fitness regime is indeed so vital to stay young & fit for a long time. 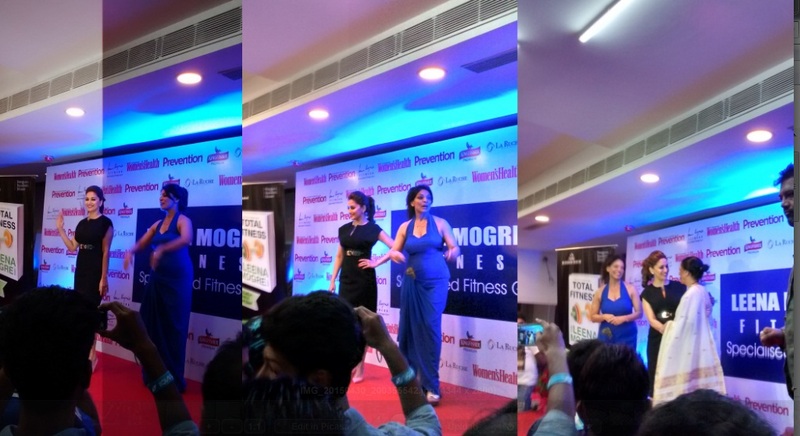 Madhuri spoke on the occasion and mentioned how Leena's guidance and expertise led her to being fit and fabulous. 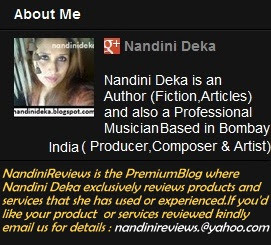 Madhuri who has also penned the foreword in Leena's book said, "I have known Leena since my 'Hum Apke Hai Kaun' days. She was my first trainer and has helped me understand my body and how important it is to look fit and feel healthy. She has shared her wealth of experience and knowledge in the book to help you achieve 'Total Fitness' by learning and adapting from it. Her passion reflects in her book." She look quite down-to-earth inspite of the glamorous aura. The book got unveiled soon, by who else but the pretty hands of the Diva herself! 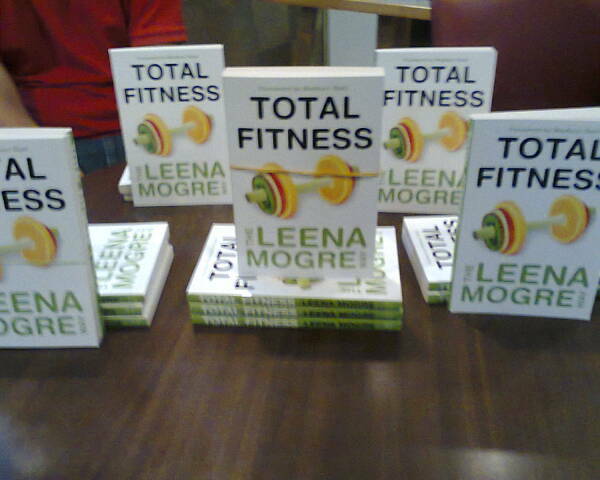 The PR...About Leena Mogre - She is armed with a Masters in Food and Science & Nutrition and Sports Nutrition. She started her journey in the fitness industry over two decades ago and her own signature brand of fitness centres over a decade ago and has over the years trained and guided actors like Ranbir Kapoor, Kareena Kapoor, Bipasa Basu, Deepika Padukone, Jacqueline Fernandez, Katrina Kaif, Soha Ali Khan and Aditya Roy Kapoor to her credit. 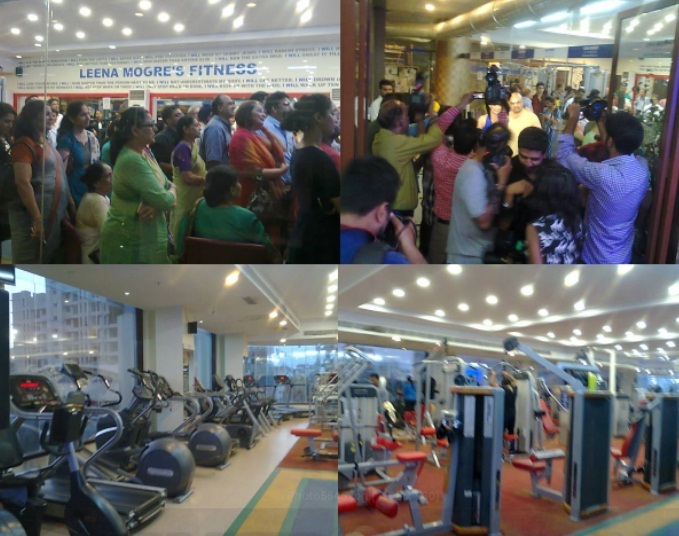 Lenna Mogre currently has a 24x7 well equipped and functional gymnasium in Bandra ( W ) and another in Dadar ( W ), Bombay. She also has a signature fitness centre in Chandigarh.